Ottawa was one of 10 cities across Canada where the Syrian community coordinated blood drives Saturday to 'give back' to their adopted homeland. Mohamed Almajaresh's anemia might have kept him from donating blood — but it didn't stop him from convincing his parents to. The 16-year-old was present Saturday afternoon at the Canadian Blood Services office on Carling Avenue, translating for his mother, father and dozens of other Syrians who rolled up their sleeves for Syrian Canadian Donation Day. "It's important to me because Canada did a lot for Syrian people," said Almajaresh. "So people have to give back the favour for Canadian people, and donate for them. We have to do something for them." Ottawa was one of 10 cities across Canada where the Syrian community coordinated a day of charitable giving. 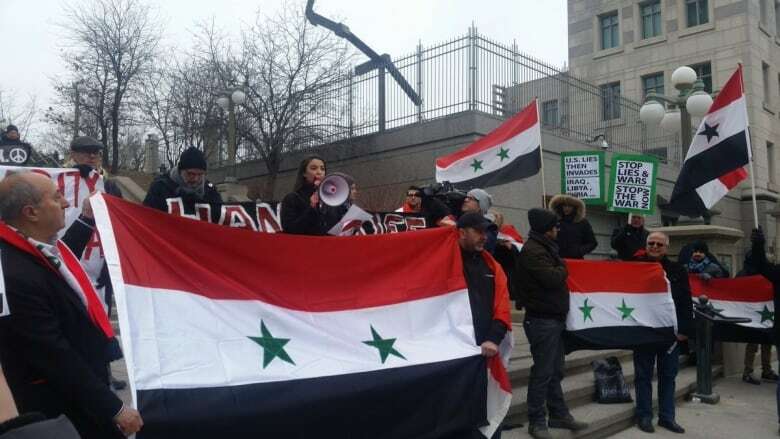 For many, however, the desire to send a message of thanks to Canadians was hard to disentangle from concerns about their own homeland, after an alleged chemical attack by the Assad regime shook the country and was followed by international air strikes. While Saturday's blood drive was wrapping up, dozens of people protested the air strikes outside the U.S. Embassy. "Having families that might be under attack at any minute is really frustrating ... you just feel helpless," said Ottawa blood drive volunteer Rabea Alriffai, who arrived in Canada from Syria as a privately-sponsored refugee in 2016. "It's really bad, and I'm afraid this is going to be even worse." National campaign organizer Noor Sakhniya reached out to people across Canada to set up Saturday's events. He told CBC Radio's All in a Day that Syrian immigrants feel "very blessed" to have access in Canada to basic rights, which their friends and family members back home have long been fighting for — things like freedom, dignity and human rights. "Killing has been happening [in Syria] for seven years," he said. "I would go for anything that was saving lives — whether it was a coalition attack, whether it was political discussion. Whatever can save people's lives, I'm with it." The blood drive, he said, was his community's attempt to be "a vital part" of the Canadian mainstream, and he hoped it would continue for years to come. "I have a dream that [this event] will be happening [for many] years," Sakhniya said. "And the next generations will take it as a symbol of gratitude, and a memory to remember all the generosity and all the welcoming." At the blood drive, Douaa Amir said she was "a little bit nervous" as she waited for a nurse to stick a needle into her arm — but also grateful to have the opportunity. "I'm feeling so good, feeling that at least I can do something to appreciate what Canada has done for Syrian refugees," she said. Many of those who donated blood Saturday wanted to show Canadians that they "are not just numbers," said Abdullah Al-badarneh, vice-president of the Humans for Peace Institution, which helped organize the blood drive. "They want to say thank you," Al-badarneh said. "They are trying to give back to the community as they can — and also to send a message to their kids that they are part of the city now, that they have to integrate; be good citizens."